4/20/18 – Cole Jones posted in this reddit thread in response to the flyers where, in a sloppy attempt to absolve himself, he actually admits to being associated with a member of Atomwaffen Division as well as members of Patriot Front. He also admits to having the Sonnenrad tattoo on his chest, and says he has “no qualms” about befriending white supremacists. The account he posted from has been deleted, but the posts remain in-tact as of today. 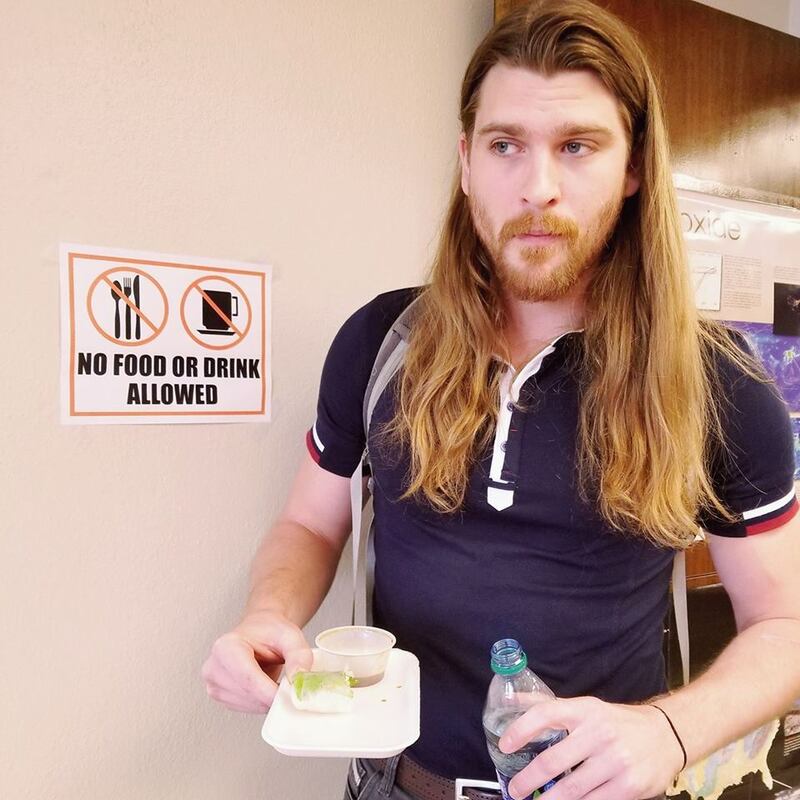 Cole Richard Jones is a PHD student at University of Houston Main Campus, currently finishing his Master’s Degree in Geology. He is also a Teacher’s Assistant, and studies under Dr. Regina Capuano. Additionally, he recently became the drummer for the local metal band Green as Emerald. 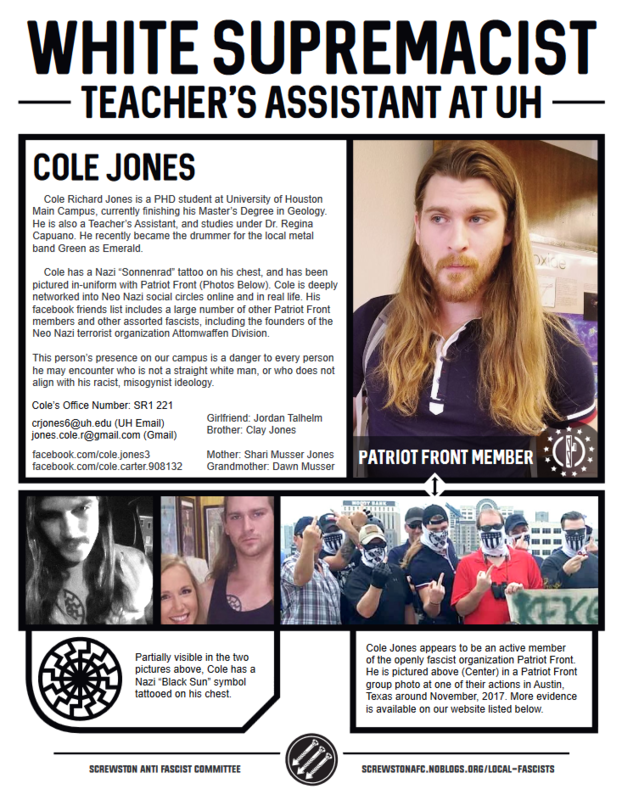 Cole proudly sports a large Nazi “Black Sun” aka “Sonnenrad” tattoo on his chest, and has been pictured in-uniform with Patriot Front members at one of their gatherings in Austin, Texas (Photos Below). Cole is deeply networked into neo-Nazi social circles online and in real life. 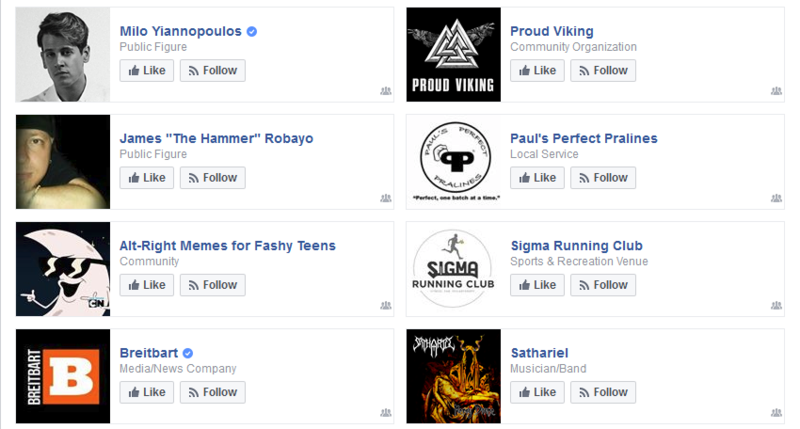 His Facebook friends list includes a large number of Patriot Front members and other assorted fascists, including the founders of the neo-Nazi organization Atomwaffen Division which has become infamously tied to a number of murders and bomb plots around the country. 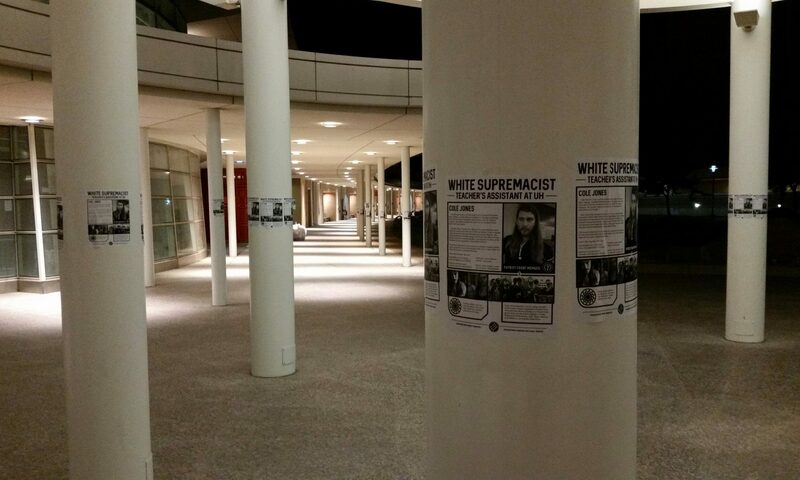 Hundreds of flyers showing Cole’s ties to these organizations were posted all over the University of Houston’s Main Campus to be discovered by students on Tuesday morning. View more details as they are updated in the Local Fascists section of our site. Cole Jones at UH wearing his Patriot Front Polo shirt. Cole is not shy about showing off his Patriot Front uniform shirt in his facebook profile picture. The navy blue polo shirt with red and white stripes on the sleeves and white stripe down the front creates a distinctive yet “respectable” and “clean cut” look. The color scheme invokes patriotism and the polo-style shirt is a subtle nod to skinhead culture in which both racist and anti-racist skinheads favored Fred Perry brand polo shirts. 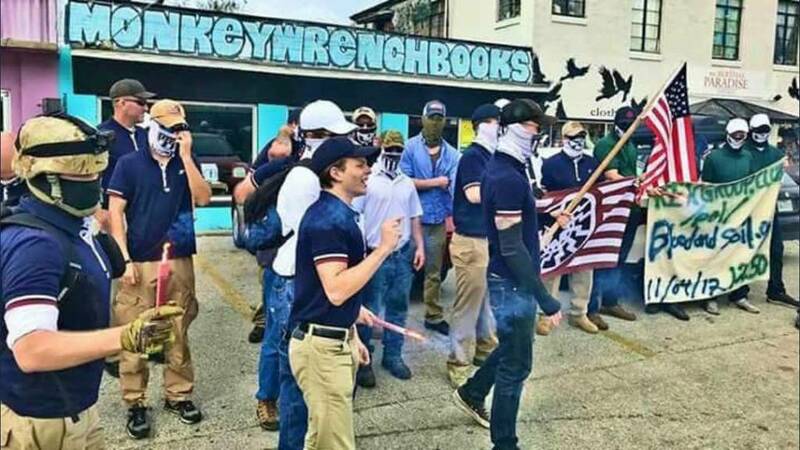 Members of Patriot Front, many wearing their navy uniform shirts, protest outside Monkeywrench Books in Austin, November 2017. 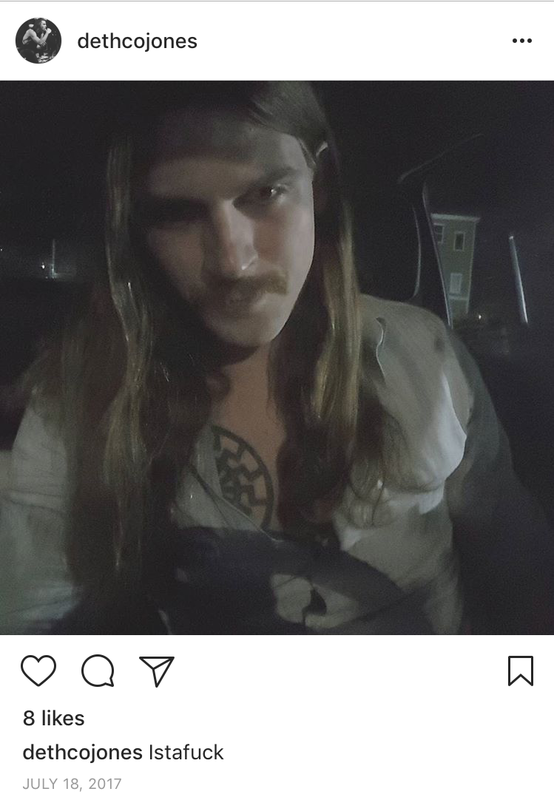 A selfie of Cole Jones on his Instagram, with white supremacist Sonnenrad tattoo partially visible. Cole is also not shy about displaying the Sonnenrad tattoo on his chest. According to the Southern Poverty Law Center and the Anti-Defamation League, the Sonnenrad (aka Schwarze Sonne, Black Sun, or Sun Wheel) is an ancient symbol that was appropriated by Nazi Germany and frequently used by the Nazi Party, the SS and the SA. 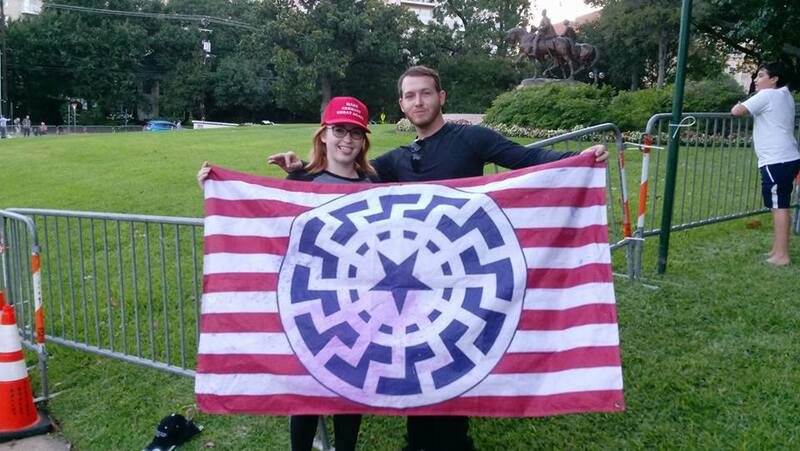 The SPLC says the “symbol has become synonymous with myriad far-right groups who traffic in neo-Nazi and/or neo-Volkisch ideologies,” and was featured prominently at the white supremacist demonstrations in Charlotesville last summer. 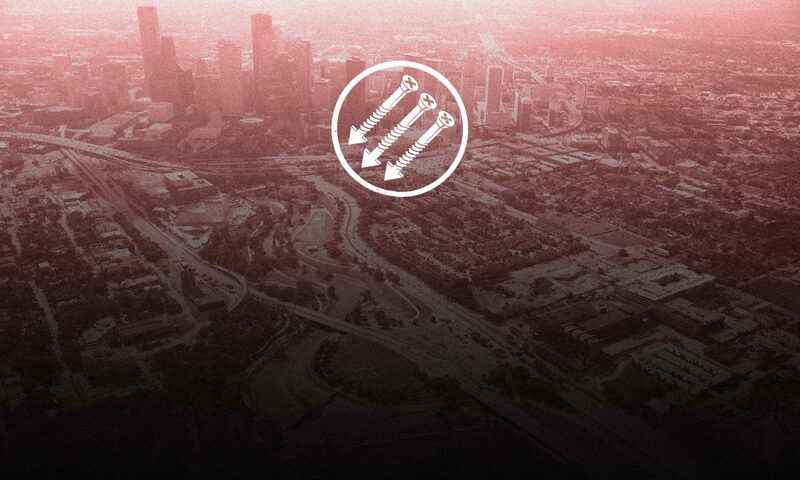 It also appears on a flag frequently carried by Houston neo-Nazi William Fears. 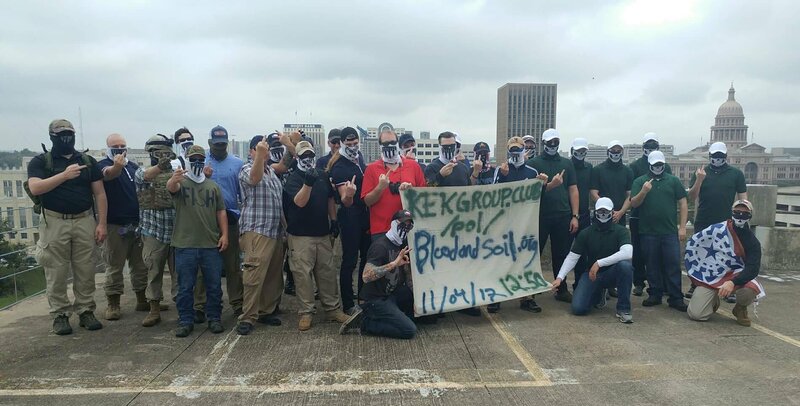 William Fears holding a Sonnenrad flag in Dallas in September 2017. As white supremacists have tried to hide their racist and violent ideologies and blend in with certain subcultures, they have increasingly relied on obscure and ambiguous symbolism to identify themselves to one another without drawing as much alarm from the public. While the Sonnenrad has deep and long-standing Nazi connotations, other symbols like the Valknot–three interlocking triangles–can be much more ambiguous, and offer white supremacists who display them a level of plausible deniability. 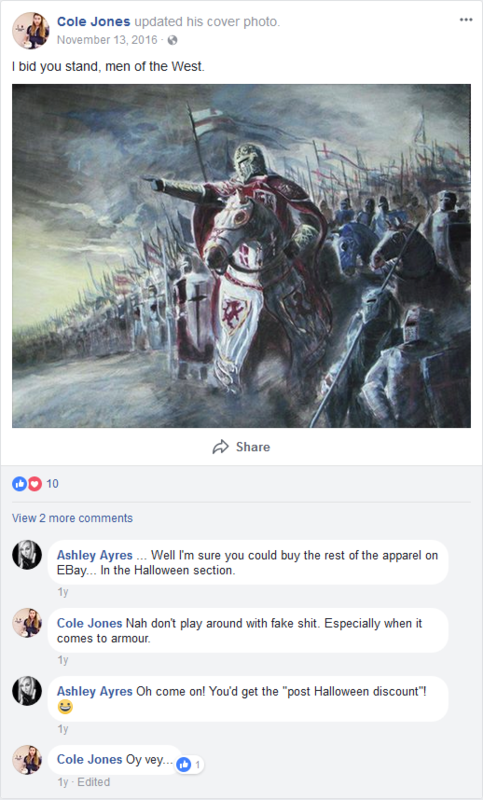 Some of Cole Jone’s Alt-Right page likes on Facebook, including a page featuring a Valknot image. Similarly, overt white supremacy often tries to masquerade as a defense of “The West” or Western Civilization, often coupled with crusade imagery and symbolism. 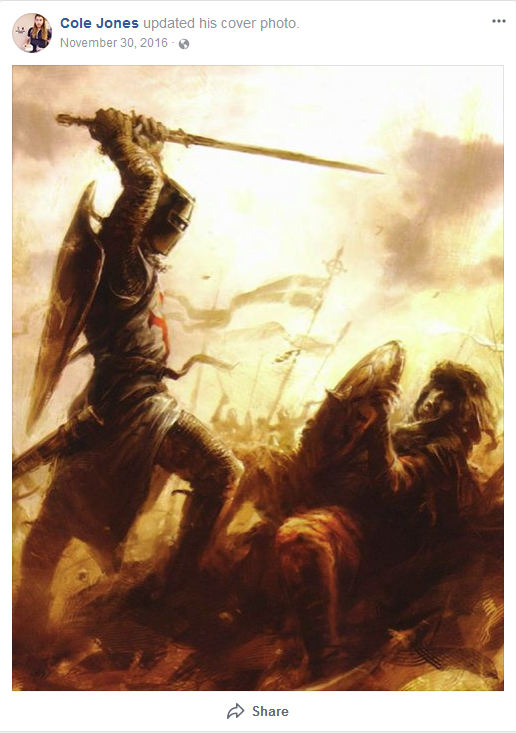 Similar to the Norse imagery, the Crusade imagery serves as a visual dog-whistle to like-minded people while allowing plausible deniability to to everyone else. Note that Cole Jones says “Oy Vey” when someone else mentions getting a discount in the comments. This is a Yiddish phrase that Alt-Right anti-Semites sometimes say ironically to friends, to make fun of Jewish people. On May 1, 2017, he was seen with fellow white supremacist Gabriel Grant on campus harassing and intimidating migrant rights demonstrators. 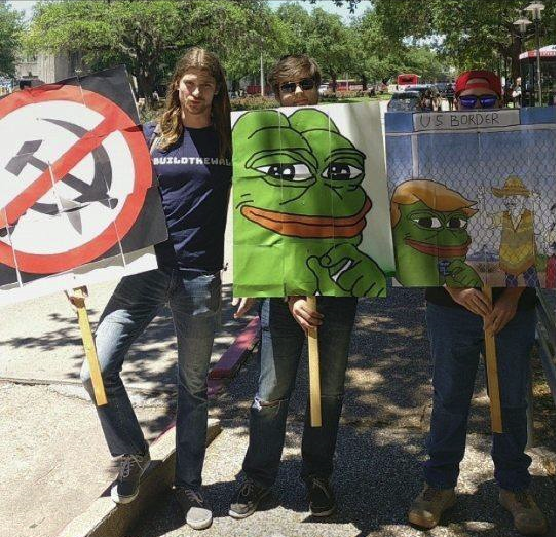 He also participates in various Patriot Front demonstrations and photo-ops across Texas.